Sunday River in Maine makes epic snow on eight peaks sprawling 870 acres and eight miles. The snow flows like h20 at the River, call it the 1900 snow gun salute. Conditions are so consistent here, so is the white carpet grooming. You will find great kids ski and ride programs like Mogul Munchkins and Meisters, an abominable mascot named Eddy the Yeti, plus family entertainment and fireworks. Terrain parks like Simon Dumont’s T72 will have your teens stoked. Stay at either slopeside hotel , The Grand Summit or Jordan Grand Hotel, book-ending the resort, and hit the outdoor heated pool. Sugarloaf, sister resort to Sunday River, is a big mountain with Sugarloafbig heart – the largest in New England with 1,056 acres. The Loaf shines with beginner terrain on Boardwalk to wicked White Nitro steeps off the 4,237-foot summit, and plentiful lodging in mountainside condos or the Sugarloaf Mountain Hotel. Loaf locals love their resort village as much as folks from away, blend in by ordering Bag burgers and get your family photo with Amos the Moose. Visit Sunday River or Sugarloaf during Children’s Fest mid January, midweek, when kids ski and stay free and get free lessons and rentals. Bretton Woods, New Hampshire’s biggest ski area (464 acres), is beloved for its beautiful views of Mount Washington and gorgeous grooming on ego satisfying terrain. The grand 1902 Mount Washington Hotel, part of Omni Mount Washington Resort, provides sumptuous lodging, spa treatments, dinner and dancing in the elegant ball room or cocktails in the Prohibition Cave. Your youngster will enjoy evening Kids Club, plus milk and cookie turndown service. Who knew a ski trip could be so sublime? Stowe When your kids are ready for more formidable terrain, go to Stowe. The legendary Front Four challenges the best, and the efficient quads and gondola keep you flying uphill in between. Staying at the swank Stowe Mountain Lodge steps from the lifts in Spruce Village seems more Deer Valley than Vermont. Soak in the luxurious outdoor heated pool, enjoy Vermont farm to table cuisine in Solace, then catch a live act at the Performing Arts Center. 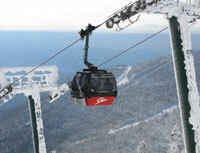 You have arrived when you ski Stowe – the Ski Capital of the East. Okemo sounds funny, and it is – a fun place to ski. Okemo prides itself on outstanding lifts, snowmaking and grooming, and friendly Vermont hospitality. After a great day at ski camp, take the kids Ziplining, on the Timber Ripper Mountain Coaster, splash in the Spring House pool or a twirl in the Ice House rink. Another nod to Okemo is their superior ski area food, from Asian at the summit, Waffles on the slopes, to wood fired flatbreads, signature martinis and s’mores by the fire for the kids at Coleman Brook Tavern in the slopeside Jackson Gore Inn. 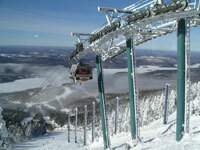 Sugarbush in the Mad River Valley of Vermont is two great ski mountains interconnected into one. 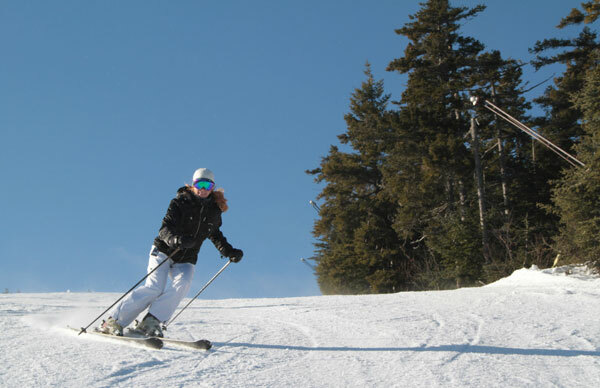 Lincoln Peak and Mt Ellen both offer great skiing, and the base at Lincoln now has ski in ski out resort hotel lodging at Clay Brook. You can walk to the lifts, the Schoolhouse children’s programs, the Castlerock Pub, ski shop and skier services and hit the big beautiful outdoor heated pool for après ski with the kids. North Conway in New Hampshire is convenient, affordable and super scenic as the heart of the White Mountains and Mt Washington Valley. You have four ski resorts within 20 minutes of each other, Cranmore, Attitash, Wildcat and Black Mountain. You can stay at a major chain hotel, one of the many inns and condos resorts like Nordic Village or lodge at the grand old Eagle Mountain House – also in the beautiful town of Jackson. Après ski for families there’s outlet shopping, sledding, the Mount Washington Weather Museum, and the Adventure Center at Cranmore. For a European ski trip without jetlag, Tremblant in Quebec is just the ticket – this extravagant French Canadian ski resort, north of Montreal, offers skiing on multiple faces, and superb après ski. The alpine village is like Disney on snow – delightful architecture, animated shops, bustling bistros, and an amazing water park – La Source. Your kids will learn to ski or board, and be outfitted with a GPS tracker, at Ecole sur Neige. Most everyone speaks English, but you will be immersed in la belle vie à Tremblant.